Psalms 3-7 all begin with God. David faces tremendous difficulties, some of them due to his own sin. Such disastrous experiences and perilous times make it nearly impossible to bear up under the weight pressing down upon him and the stress draining him. So what does he do?–he kneels, and prays. He turns to the only one who can actually resolve his personal problems: Yahweh. 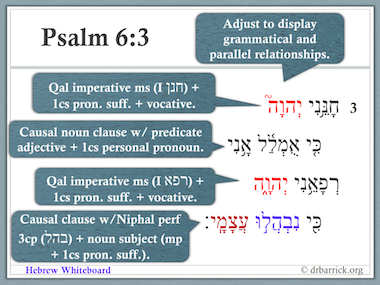 Psalm 6:1-4 (Hebrew verse numbering) continues our analysis of the Psalter psalm by psalm, verse by verse, phrase by phrase. Psalm 6 highlights a horrific (that’s David’s word for it) situation in the psalmist’s life. The master poet displays his skillful use of the Hebrew language to express his peril and, ultimately, his praise to God, his grace-giving Savior. Click on Hebrew Whiteboard to download Psalm 6:1-4 or any of the previous studies of Psalms 1-5 and 120-122.